For the body of water, see Lake Placid (New York). Location in Essex County and the state of New York. The village of Lake Placid is near the center of the town of North Elba, 50 miles (80 km) southwest of Plattsburgh. Lake Placid, along with nearby Saranac Lake and Tupper Lake, comprise what is known as the Tri-Lakes region. 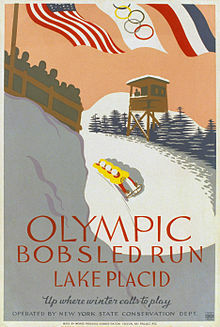 Lake Placid hosted the 1932 and the 1980 Winter Olympics. Lake Placid also hosted the 1972 Winter Universiade, the 2000 Goodwill Games, and will host the 2020 ISU World Synchronized Skating Championships and the 2023 Winter Universiade. Lake Placid was founded in the early 19th century to develop an iron ore mining operation. By 1840, the population of "North Elba" (four miles southeast of the present village, near where the road to the Adirondak Loj crosses the Ausable River) was six families. In 1845, Gerrit Smith arrived in North Elba and not only bought a great deal of land around the village but granted large tracts to former slaves. He reformed the land law and demonstrated his support of Abolitionism. The abolitionist John Brown heard about Smith's reforms, and left his anti-slavery activities in Kansas to buy 244 acres (1.0 km2) of land in North Elba. This parcel later became known as the "Freed Slave Utopian Experiment," Timbucto. Shortly before his execution in 1859, John Brown asked to be buried on his farm, which is preserved as the John Brown Farm State Historic Site. As leisure time increased in the late 19th century, Lake Placid was discovered as a resort by the wealthy, who were drawn to the fashionable Lake Placid Club. Melvil Dewey, who invented the Dewey Decimal System, designed what was then called "Placid Park Club" in 1895. This inspired the village to change its name to Lake Placid, which became an incorporated village in 1900. Dewey kept the club open through the winter in 1905, which aided the development of winter sports in the area. Nearby Saranac Lake had hosted an international winter sporting event as early as 1889, and was used year-round by patients seeking treatment for tuberculosis at sanatoria. The fresh, clean mountain air was considered good for them and was a common treatment for tuberculosis at the time. By 1921, the Lake Placid area could boast a ski jump, speed skating venue, and ski association. In 1929, Dr. Godfrey Dewey, Melvil's son, convinced the International Olympic Committee (IOC) Lake Placid had the best winter sports facilities in the United States. The Lake Placid Club was the headquarters for the IOC for the 1932 and the 1980 Winter Olympics in Lake Placid. In addition to the John Brown Farm and Gravesite, the Mount Van Hoevenberg Olympic Bobsled Run, New York Central Railroad Adirondack Division Historic District, and United States Post Office are listed on the National Register of Historic Places. Lake Placid hosted the Winter Olympics in 1932 and 1980. During the 1932 games, the trails outside of the village served for the cross-country skiing events and the cross-country skiing part of the Nordic combined event. Lake Placid, St Moritz, and Innsbruck are the only sites to have twice hosted the Winter Olympic Games. Jack Shea, a resident of the village, became the first person to win two gold medals when he doubled in speed skating at the 1932 Winter Olympics. He carried the Olympic torch through Lake Placid in 2002 shortly before his death. His grandson, Jimmy Shea, competed in the 2002 Winter Olympics in Salt Lake City, Utah, in his honor, winning gold in the Skeleton. In the U.S., the village is especially remembered as the site of the 1980 USA–USSR hockey game. Dubbed the "Miracle on Ice", a group of American college students and amateurs upset the heavily favored Soviet national ice hockey team, 4–3, and two days later won the gold medal. Another highpoint during the Games was the performance of American speed-skater Eric Heiden, who won five gold medals. Lake Placid was interested in bidding for the 2016 Winter Youth Olympics but decided against it; Lillehammer, Norway, was the only bidder and was awarded the games. Lake Placid shifted its interest toward bidding for the 2020 Winter Youth Olympics, but it again did not submit a bid. Lake Placid is well known among winter-sports enthusiasts for its skiing, both Alpine and Nordic. Whiteface Mountain (4,867 ft or 1,483 m), in nearby Wilmington about 13 miles (21 km) from Lake Placid, offers skiing, hiking, gondola rides, and mountain biking, and is the only one of the High Peaks that can be reached by an auto road. Whiteface Mountain has a vertical elevation of 3,430 feet (1,050 m), the highest vertical elevation of mountains in Eastern North America. The area has one of only 16 bobsled runs in the Western Hemisphere. In 2010, U.S. News & World Report highlighted Lake Placid as one of the "6 Forgotten Vacation Spots" in North America. 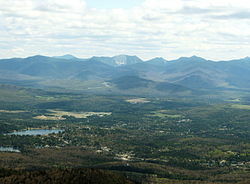 Many people use Lake Placid as a base from which to climb the 46 High Peaks in the Adirondack Mountains. Those who complete these climbs may join the Adirondack 46ers. Lake Placid built its first golf course in 1898, one of the first in the U.S., and has more courses than any other venue in the Adirondacks. Many of its courses were designed by well-known golf course architects, such as John Van Kleek, Seymour Dunn, Alexander H. Findlay, and Alister MacKenzie. The geographic features of the Adirondacks were considered reminiscent of the Scottish landscape, where the game started, and thus a fitting canvas for original play, or "mountain golf." Lake Placid is near the West Branch of the Ausable River, a well-known stretch of water for fly fishing. More than 6 miles (10 km) of the West Branch are designated as year-round catch-and-release, artificial-lures-only water. Since 1999 it has been a site for the annual Ironman Lake Placid Triathlon, the second oldest Ironman in North America and one of only ten official Ironman Triathlons to be held in the continental U.S.
ESPN's Great Outdoor Games were inaugurated here in July 2000; they were held in Lake Placid again the following year, but moved to Madison, Wisconsin, in 2002 and were eventually discontinued. The Lake Placid and I Love New York Horse Shows have been held at the North Elba Showgrounds for the past 41 years. Multiple IWPA (International Weight Pull Association) snow Weight pulling events are held at the North Elba Showgrounds yearly. Nearby Saranac Lake, New York, hosts an Annual Winter Carnival, one of the oldest Winter Carnivals in the country, complete with an Ice Palace. Lake Placid is also home to the Lake Placid Sinfonietta, a professional summer chamber orchestra that has existed since 1917 and offers concerts lakeside. The Winter Empire State Games are held in Lake Placid every February. The Lake Placid ice dance competition is held every year in July or August in the 1980 Olympic Arena. CAN/AM hosts an adult pond hockey tournament on Mirror Lake every January. The Adirondacks Ragnar Relay race goes from Saratoga Springs to Lake Placid every September. The Lake Placid Summit Classic Lacrosse Tournament is held every year in early August since 1990. In Lake Placid, public education is administered by the Lake Placid Central School District. Lake Placid is served by nearby Adirondack Regional Airport in Saranac Lake, 16 miles (26 km) from the village. Lake Placid Airport, two miles south of the village, does not offer scheduled service but chartered flights are available. Other relatively nearby airports include Albany International Airport, Burlington International Airport and the airport in Plattsburgh. Lake Placid is also served by an Amtrak Thruway Motorcoach connection through Westport via limousine service. Adirondack Trailways stops there as well. Lake Placid is not located on any interstate highway. It can be reached from Interstate 87 to the east via New York State Route 73, New York State Route 86, and New York State Route 9N. County Roads 21, 31 and 35 also serve the community. The New York Central Railroad ran daily passenger trains to New York City, via Utica until the 1960s. Today it is also the northern terminus of the Adirondack Scenic Railroad, over former New York Central and Delaware & Hudson trackage. There are currently plans to restore service to Utica, New York. According to the United States Census Bureau, the village has a total area of 1.5 square miles (4.0 km2), of which 1.4 square miles (3.6 km2) is land and 0.15 square miles (0.4 km2), or 10.79%, is water. The village is located near the south end of Lake Placid lake. More immediate to the village is Mirror Lake, which lies between the village and Lake Placid. Lake Placid has a cool humid continental climate with large seasonal differences and high precipitation throughout the year. As of the census of 2000, there were 2,638 people, 1,303 households, and 604 families residing in the village. The population density was 1,913.2 inhabitants per square mile (738.7/km2). There were 1,765 housing units at an average density of 1,280.1 per square mile (494.2/km2). The racial makeup of the village was 95.75% White, 0.68% African American, 0.45% Native American, 0.91% Asian, 0.57% Pacific Islander, 0.19% from other races, and 1.44% from two or more races. Hispanic or Latino of any race were 0.91% of the population. There were 1,303 households, of which 22.3% had children under the age of 18 living with them, 34.1% were married couples living together, 8.4% had a female householder with no husband present, and 53.6% were non-families. 45.7% of all households were made up of individuals, and 16.9% had someone living alone who was 65 years of age or older. The average household size was 2.02, and the average family size was 2.93. The population was spread out with 22.4% under the age of 18, 8.5% from 18 to 24, 33.2% from 25 to 44, 19.3% from 45 to 64, and 16.6% who were 65 years of age or older. The median age was 37 years. For every 100 females, there were 92.4 males. For every 100 females age 18 and over, there were 88.3 males. The median income for a household in the village was $28,239, and the median income for a family was $43,042. Males had a median income of $26,585 versus $21,750 for females. The per capita income for the village was $18,507. About 8.5% of families and 13.2% of the population were below the poverty line, including 13.3% of those under age 18 and 17.8% of those age 65 or over. ^ a b "Geographic Identifiers: 2010 Demographic Profile Data (G001): Lake Placid village, New York". U.S. Census Bureau, American Factfinder. Retrieved February 22, 2016. ^ 1932 Winter Olympics official report. Archived 2008-04-10 at the Wayback Machine pp. 145–6, 199. ^ "BBC SPORT - Winter Olympics 2002 - Skating - Winter Olympic hero dies". ^ "Whiteface Lake Placid | the Perfect Winter Vacation." Whiteface. N.p., n.d. Web. 7 February 2015. ^ "Lake Placid, Adirondacks." Ski Whiteface Mountain. N.p., n.d. Web. 7 February 2015. ^ Miriam B. Weiner, "6 Forgotten Vacation Spots: Destinations that were hot only 20 years ago have since gone tepid, clinging to the memory of their glory days. But what caused the flux in the fad? Find out more about some of the travel industry's former heavyweights, what made them fall and whether or not they should have been forgotten." Yahoo Tavel, n.d. Found at U.S. News & World Report Travel website. Accessed December 8, 2010. ^ "2008 Lake Placid Ice Dance Championships". Archived from the original on 2010-12-25. Retrieved 2014-12-19. ^ "Lake Placid, New York Climate Summary". Weatherbase. Retrieved 23 June 2015. ^ "Lake Placid, New York Temperature Averages". ^ a b c d e "Meet Your Lake Placid Olympians!". www.adirnondack.net. Retrieved January 23, 2015. Wikimedia Commons has media related to Lake Placid, New York. Wikivoyage has a travel guide for Lake Placid.